TextMaker 2008: the reliable and friendly word processor that reads and writes all Microsoft Word files without a hitch. SoftMaker Presentations 2008: It combines user-friendliness with many powerful features. You can create striking and informative presentations quickly and effectively. It’s fully compatible with Microsoft PowerPoint. BasicMaker 2008: a scripting language and environment that lets you automate recurring tasks. You can control TextMaker, PlanMaker and other VBA-compatible programs using SoftMaker Basic scripts. 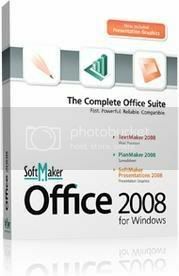 How to get SoftMaker Office 2008 for Windows for Free? Loadandhelp.de is offering SoftMaker Office 2008 for free. SoftMaker donates € 0.10 for every successful download to well-chosen development and charity projects on betterplace.org. This is certainly a good initiative by Softmaker. So, folks! Every download counts. To grab your free copy go to Loadandhelp.de, click on the download button, enter your Name, Email address, Country and click on Submit, You’ll receive the download link and the activation code in your email.